CCTV Inspection from Pactek Environmental Services, serving South Yorkshire and beyond. 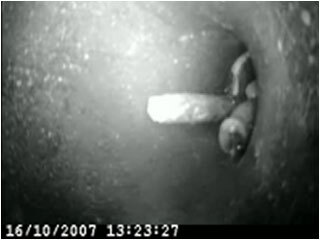 The image, shown right, is from our CCTV equipment investigating a blocked drain. We supply a DVD as evidence for dispute purposes etc. We offer advice and a quotation where any work is needed (no obligation). We also track and trace drains. Serving Commercial and Domestic Clients. YES! We can help you - Please contact Pactek with all enquiries. We work all hours and can be with you quickly in an emergency situation. Hydro Blasting / Cleaning, Drain Cleaning / CCTV Inspection, Water Pumping, Bio Remediation, Organic Solutions for Land & Water, Ventilation / Extraction System Cleaning.